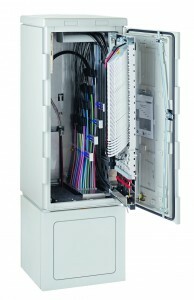 The new generation of the cross connection solution by R&M is called the HD SCM street cabinet. The same size housing can now accommodate 50 percent more FO connections – plus Single Circuit Management. Distribution sites for FO networks on the street are often very difficult to extend when the number of cables increases. So R&M simply compressed what is inside. 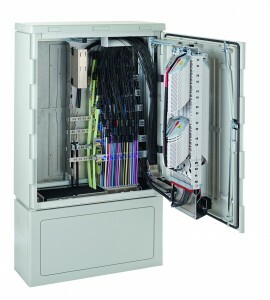 The new generation of the cross connection solution is called the HD SCM street cabinet. The same size housing can now accommodate up to 50 percent more FO connections. The cabinet has space for 1440 splice connections. That is a world record in this segment. HD stands for high density, in other words high packing density. 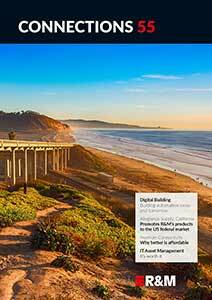 SCM is the tried and tested Single Circuit Management System from R&M. That is the modular, handy tray technology for splice accommodation and for secure FO management. R&M offers four different versions of the HD SCM street cabinet with a multitude of possible applications. This enables network operators to react to different infrastructures and cabling strategies as well as to special site and market conditions. Adaptations and customized pre-terminable SCM modules can be provided to suit special applications, proprietary standards and national specifications.